A Locational Clearance, commonly referred to a Zoning Permit, is one of the prerequisite documents before a person can get a Building Permit. This is to ensure that construction of the building follows the Comprehensive Land Use Plan and Zoning Ordinance of the city or municipality. In case you are starting up as an entrepreneur who is driven to start the construction of the building for your business in your locality, there are things to consider behind the scenes other than the construction materials, architectural plans or how good the building you are about to build. These are the legal documents you need to prepare before the construction can commence legally. One of them is the locational clearance. Well, this is not difficult to get if you have the complete set of legal documents needed and you have the oversight of the general procedure. 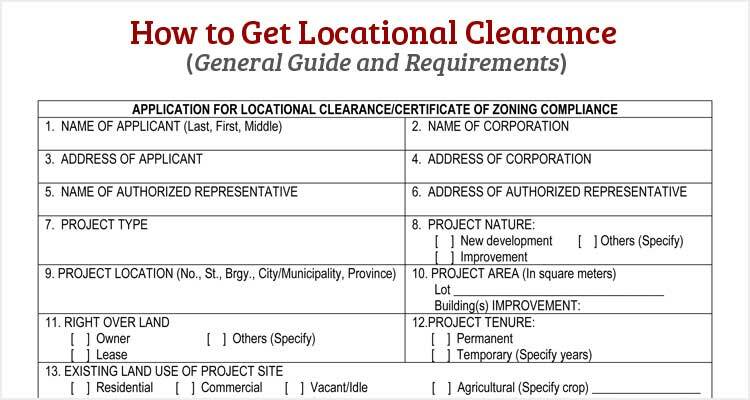 This article will serve as a general guide on how to get locational clearance in the Philippines including the requirements and step by step process. Go to the Office of the Municipal/City Planning and Development in the locality where the building to be constructed is under its jurisdiction. Shared above are the general requirements. Depending on the ordinance and/or procedure being followed in the city or municipality as well as the type of building project you are about to build, there could be more or less requirements than that. Get a checklist of requirements and the application form in the office. After the completion of your requirements, go back to the office and submit the duly filled-up and notarized application form along with your documents. It shall be verified and evaluated by a Zoning Officer. A Zoning Inspection will be scheduled to check if the building project conforms with the existing Comprehensive Land Use Plan and Zoning Ordinance in the locality. A Zoning Inspection Report shall then be submitted by the Zoning Inspector and you’ll be asked to secure an Order of Payment. Proceed to the Treasurer’s Office and pay for the corresponding fees. Present your proof of payment to the person-in-charge in the Office of the Municipal/City Planning and Development. Your clearance will then be prepared and be made ready for approval. Once approved, claim your Locational Clearance. That was the general guide on how to get location clearance intended to give you an overview of the entire process. However, depending on the ordinance and actual procedure being observed in your locality, there could be more or less requirements and steps to acquire the clearance. If you have successfully got your locational clearance, do share some tips on the comment section.